It is not that hard to do the right thing. Well, you might lose everything, but after the shock has worn off, you haven’t died. On the other hand, if you choose the wrong thing someone might die. Children might die. We are so bombarded by the constant stream of disturbing news that we pretty quickly move on from one frustrating reality to the next jaw-dropping event. But even with Justice Kennedy’s announced resignation, one newsworthy item is staying in the headlines. It is the more than 2,000 children who remain separated from their parents. This past weekend there were 628 protests in 50 states against the current administration’s stance on immigration issues, particularly as it relates to those 2,000 children. Many Americans are outraged, and with good reason. These children will suffer lifelong mental health issues because of the unconscionable action taken by this administration. But I have been almost as appalled by the lack of action taken by the evangelical church as I have been by the edicts coming out of Washington. When it comes to the border crisis, megachurch pastors have responded like political pros, using flowery words that signify nothing. I read the response of one megachurch pastor that was silky smooth and utterly toothless. Basically it said, “Whatever conclusion you reach, it is your conclusion, and as long as you’ve thought it through, your conclusion is good.” Except that separating mothers from their children is not good. It is never good. It never has been good. It never will be good. But these guys, and they are all guys, are so afraid of alienating someone, they take no stand, which of course is a stand. To make a rather drastic but not altogether inappropriate analogy, the Holocaust would never have happened without the stony silence of the German church. Of course, America’s evangelical churches do take a stand. They take a stand on the pet subjects of their male leadership. They take a stand against perfectly normal and healthy LGBTQ people, because their tribe has deemed that population to be a threat. They take a stand against abortion, while allowing irreparable damage to be done to children who are already breathing. I believe the lack of response to the border crisis is one more giant misstep sealing the fate of the current leaders of the American evangelical church. Their empty rhetoric in these critically important hours reveals the mold eating away beneath their polished facade. The evangelical church may not recover, and I am beginning to believe that is not a bad thing. Last week a friend tweeted, “Okay, you got your Muslim ban. When do we get our evangelical ban?” This is how a large number of Americans feel about evangelicalism. What goes around comes around. Do evangelicals not know this? Every church that gains political power eventually comes undone at the seams. 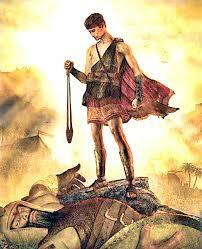 A David comes along with a sling and a stone and brings down the giant with one well-placed throw. I love all the mothers who are coming together to address this crisis, because if we’re honest, it’s the mothers who get it. Children are our most precious resource. Those who mess with their wellbeing will pray a price. It is courageous and brave women who are bringing power to the #ChurchToo movement. They came together and spoke their stories, knowing they would be vilified by many of their former friends. But nevertheless they persisted. I think we might have found our David.